The Gallimimus (gal-uh-MY-mus) is one of the Dinosaurs in ARK: Survival Evolved. When someone asks me what the fastest creatures on the island are, Gallimimus is always a contender. Unlike the Island's many armored animals, Gallimimus eschews strong defenses for the ability to outrun pretty much anything. A skittish herbivore, Gallimimus even looks nervous when eating in a peaceful, clear meadow. Having no real way to harm predators, it simply runs away and uses its agility to stay safe. I've even seen wild Gallimimus outrun speed-trained Utahraptors! There are two general camps on the use of tamed Gallimimus. One camp thinks that their inability to effectively harm hostile creatures, and their inability to harvest most resources, makes them primarily a burden to the tribe. The other camp thinks that their extreme speed and ability to jump long distances, is among the best for scouting and exploring. However, both camps agree that its ability to quickly transport multiple tribe members is uniquely beneficial. Gallimimus is a very skittish, shy species. Constantly on alert for carnivores, it never walks slowly, preferring to move around at a moderate trotting speed. When injured, it will run extremely fast away from its attacker, but is slowed down in water. Gallimimus is a large herbivore resembling something akin to a reptilian ostrich. Like an ostrich, it has a long neck and a beak for eating foods like grasses and berries. It has a slim build with a long tail to act as counterbalance when sprinting from predators like Carnotaurus and Raptors. This section displays the Gallimimus's natural colors and regions. 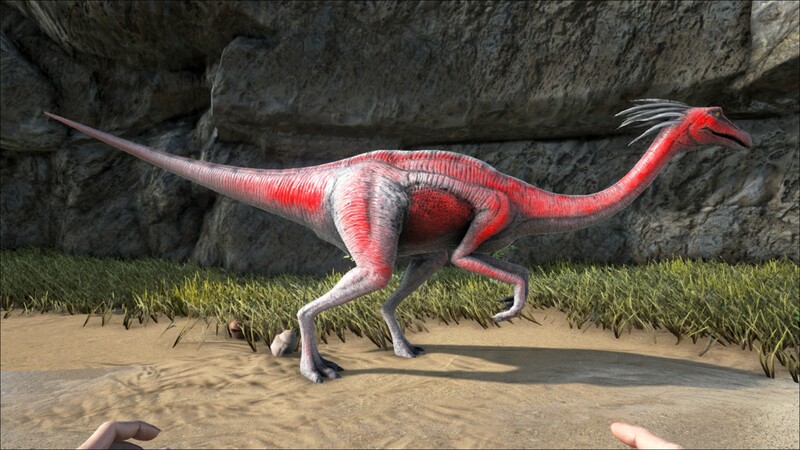 For demonstration, the regions below are colored red over an albino Gallimimus. The colored squares shown underneath each region's description are the colors that the Gallimimus will randomly spawn with to provide an overall range of its natural color scheme. Hover your cursor over a color to display its name and ID. 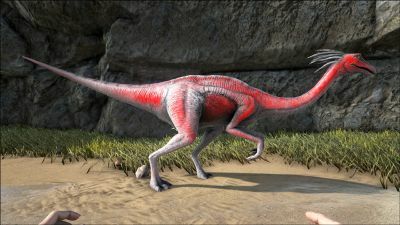 For example, "cheat SetTargetDinoColor 0 6" would color the Gallimimus's "body" magenta. Gallimimus has low health compared to its torpor, a crossbow with tranq arrows can kill them, even if you give 5 seconds between shots. The best Way to capture a Gallimimus is to grab it with a Quetzal and either have a tribe member knock it out above a safe location OR drop it into a closed cage that it cannot escape . It is recommended, due to the Gallimimus's low health, to use highly torpor-efficient weapons such as tranquilizer darts. This will minimize the possibility of accidental death to the target. If instead, you opt to settle for tranquilizer arrows, be careful about shooting the target too many times in quick succession. Due to the nature of torpor application, a percentage of the damage dealt is given to the target as torpor both instantly and as a constant over time, it is entirely possible to accidentally kill the target prior to the torpor-over-time effect to have ended from previous shots, so using a magnifying glass to see the target's health may be beneficial if it is in a cage, trapped by a bola, or being suspended by the grasp of a Quetzal. When using a crossbow try to use body shots as they have a higher effect. If you want to tame a Gallimimus outside of a cage, a good way is to use Bolas to immobilize the target and then carefully tranquilize it. Look for a safe location, perhaps surrounded by rocks. It is recommended to clear the region of dangerous carnivores and insects beforehand since Gallimimus have a low health and could be easily killed by, for example, a group of Compy. Make sure the dino is guarded and constantly fed with narcotics or narco berries during the taming process since its torpor decreases rapidly. This section describes how to fight against the Gallimimus. In general, the Gallimimus has a skittish behavior and tends to run away on the first shot. The Gallimimus, due to lacking of health becomes quite annoying to tame. The Gallimimus becomes an efficient Dinosaur after taming due to its high speed. Aiming for the head will kill the Gallimimus almost always, no matter the level. When hit, it will run off at extreme speed. Try to trap the Gally in rocks or on a cliff if it doesn't go down first time. Using a Bola you can keep it in place for thirty seconds, making it unable to get away and use its speed to its advantage. This is an easy way to tame a Gallimimus, as it will stay in one place long enough to KO it. Rifle works best but can still kill the dinosaur in one hit. It's not dangerous but if it doesn't go down on the first shot you're not likely to get another chance. It has high movement speed but a lack of health, therefore it is easy to take down. Scout: One of, if not the fastest land creatures players have access to, the Gallimimus can easily cover ground to search around the island and avoid danger. The ability to have additional riders acting as spotters/gunners allows for surprising flexibility as well (Level up Speed, Stamina, and some Health). Travel/People Carrier: With the ability to carry two passengers alongside the rider the Gallimimus can quickly move people between bases and areas discretely when compared to other mounts such as a Quetzal, which sticks out like a sore thumb when transporting people (Level up Stamina and Weight). Skirmisher: Speed and the ability to have two gunners firing all around the Gallimimus allows players to quickly enter an area and attack enemies before retreating without needing to dismount, letting you harass targets easily and quickly (Level up Health, Speed, and Stamina). Hunting: As of V253, the primary rider has the ability to use weapons while riding, meaning Gallimimus may now be used as a solo hunting mount despite the weakness of its own attack. 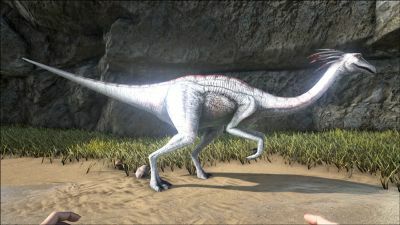 Its low weight capacity means that the weapons, gear and taming supplies that can be brought along are limited, but provided it is not overloaded or ridden into water, Gallimimus provides the ability to snipe targets from a distance and then retreat before almost anything can close the distance. In reality, Gallimimus was most likely an omnivore. Gallimimus is a member of Ornithomimosauria, a clade closely related to raptors and modern birds, it is also one of the largest of their kind. The Gallimimus saddle is unlocked at a fairly early level. However there are a few things you must consider when thinking of taming one. First, bolas are essential, because without them knocking one out with Tranq Arrows is nearly impossible. Second, the amount of metal needed may be difficult to obtain so early for some players. Lastly, their spawn regions coincide with some of the most dangerous predators on the island. So be prepared. The Gallimimus' torpor goes down at an alarming rate, having plenty of narcotics with you is a good idea. Like any animal, the Gallimimus' speed is always at a base of 100% regardless of level. That said, if all level up points are put into movement speed, the creature easily becomes "too fast for ARK", and will go flying high into the air with the slightest amount of terrain difference(such as a fallen log) when running. If you are having difficulty finding any Gallimimus in areas they should appear normally, particularly on a private server, check near (50,50) as this is a place where "glitched" dinos and lost items tend to end up. The skull seen in its dossier actually belongs to its relative Struthiomimus. The dossier states that the Gallimimus is able to outrun speed-trained raptors, however the dossier shows a Gallimimus being chased by a Rex. It is unknown why this choice was made. The Gallimimus in the game are portrayed with teeth, which the real animal never had. 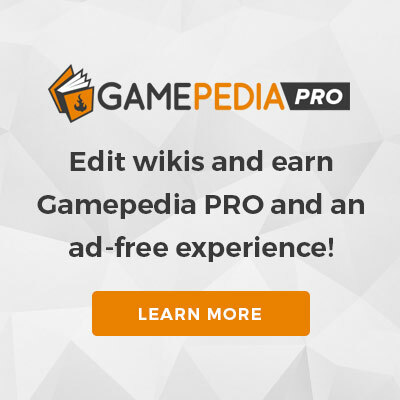 ↑ Introducing the Gallimimus & ARK Digest #11!